Blooming away in a pot at the nursery. 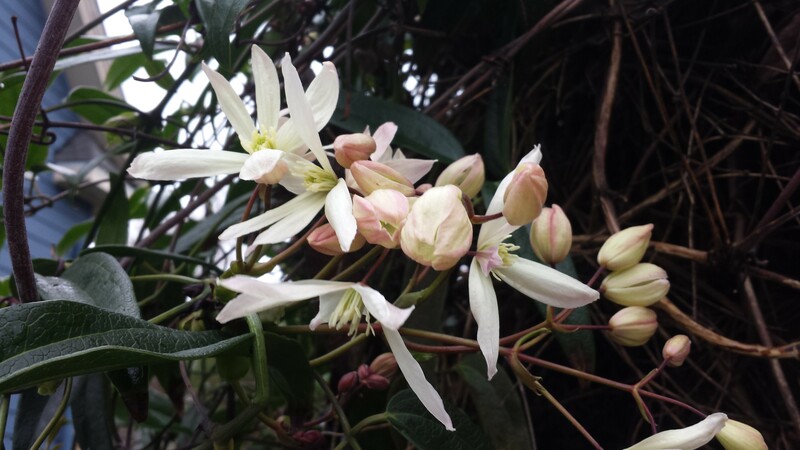 I was startled one sunny day early this month to see my daughter’s Clematis armandii already in bloom. 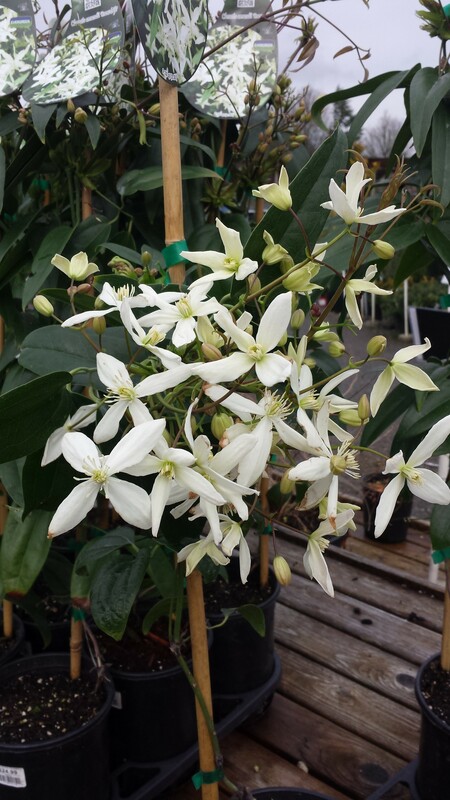 This clematis, also known as the evergreen clematis or the leatherleaf clematis because of its long leathery evergreen leaves, usually waits until mid-March to bloom here in Seattle. This year’s very mild winter, though, coaxed it into bloom more than a month early. Just a few days later, I found it blooming in a pot in my local nursery. And right after that, I saw dozens blooming at the Northwest Flower & Garden Show! Of course, they were all very young plants forced into bloom for our pleasure. Now they are blooming all over Seattle. 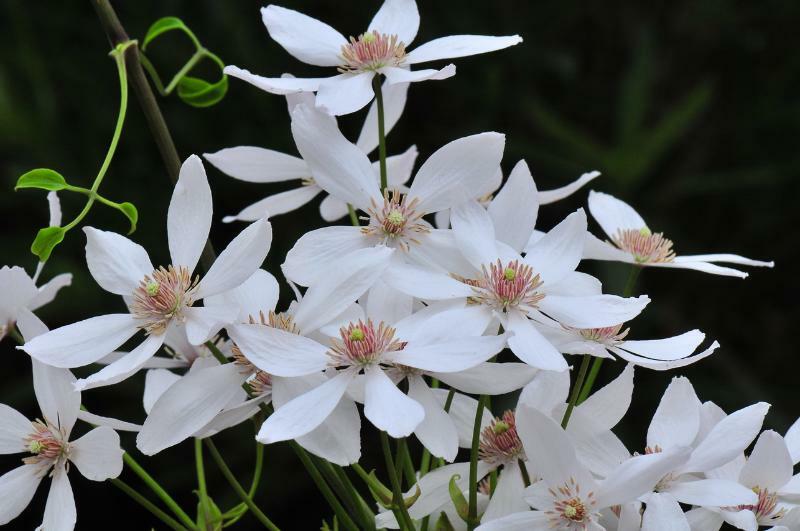 This clematis was originally brought to the West from China by well-known plant hunter Ernest Wilson in the early part of the last century and was named for French botanist and missionary Father Armand David. We have many, many plants today originally from China carrying the names wilsonii, armandii, and davidii in honor of these two men. C. armandii is somewhat tender, being hardy only to Zone 7, but when happy, it can get huge — as much as 30′ long. It’s a stunner in bloom, a sheet of white flowers tinged in pink and wafting a wonderful fragrance on a sunny spring day. Personally, I don’t grow this one, at least not yet. For one thing, it is so big! For another, evergreen does not necessarily mean ever beautiful. I have often seen C. armandii looking like a big nest of ratty brown leaves. The best way to avoid this unpleasantness is to cut it back significantly right after it blooms in spring. This will give the clematis plenty of time during late spring and summer to throw fresh new vines and set new flowers for the following year. The one C. armandii that I would like to grow when it finally comes to market is C. armandii ‘Red Heart’ (see photos above and below). This unusual new clematis has dark reddish-pink stamens in the center surrounded by pristine white tepals. 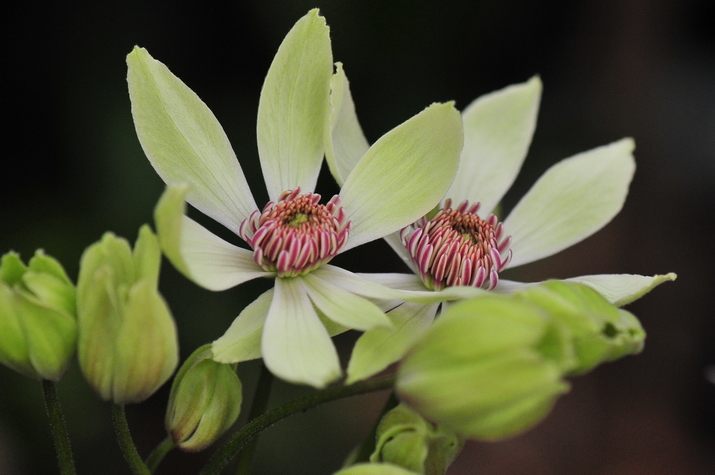 It was bred by hybridizer Ton Hannink of The Netherlands, who kindly gave me permission to show you his photos of this beautiful but not yet commercially available clematis. To die for, eh?